WOWZA! MILLION DOLLAR GOLF COURSE and WATER VIEW from this lovely DOGWOOD Designer situated in the QUIET Village of SPRINGDALE! As you enter this beautiful home the foyer leads to dining/living room with spectacular views of the GOLF COURSE and WATER. The living room has sliding glass doors that lead to the LANAI and birdcage which affords expanded outdoor living space for your enjoyment. The kitchen has stacked cabinets with crown molding, bevel-edged laminate countertops, updated sink and faucet, pantry, gas stove, ceiling fan along with a kitchen nook for casual dining. Awake to the stunning GOLF COURSE and WATER view every morning from your Master bedroom that features bamboo wood laminate flooring. The Master Bathroom has his/her sinks and access to laundry room with extra cabinets and laundry tub. The popular split floor plan model provides all the privacy your guests will need by entering the guest area through a pocket door. Wood laminate flooring is featured in both guest bedrooms. Guest bathroom has a solar tube. Expanded garage provides space for golf cart parking. New Gas heat and A/C was installed in 2016 along with a new thermostat. 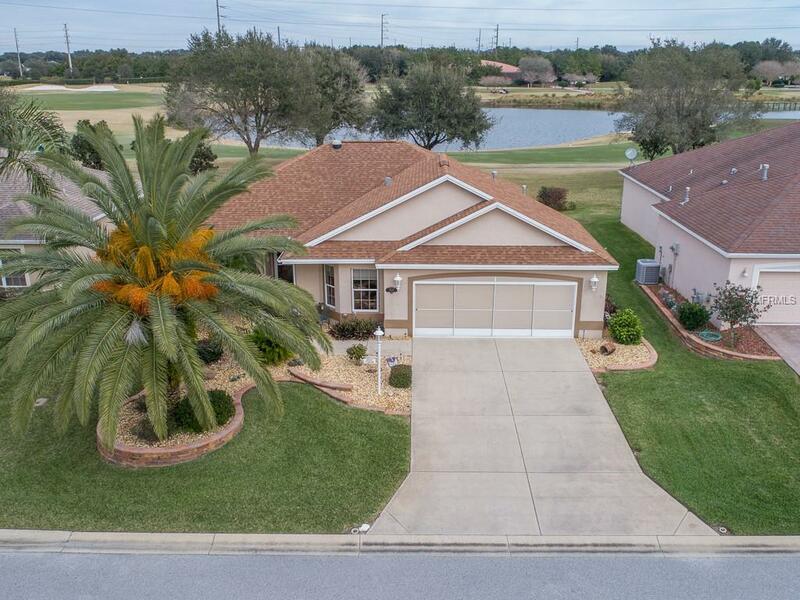 Very nice curb appeal as this home is beautifully landscaped with mature palms/shrubs w/decorative curbing strategically placed around the home. This is a marvelous home site with an AMAZING VIEW and no homes behind!